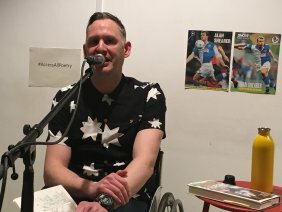 This is a follow-up to my previous post, Access all Poetry in which I talked about poetry in terms of its accessibility for disabled poets and audiences. 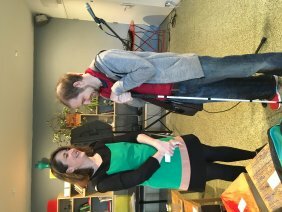 I spent Thursday night reading poetry at Spike Island with deaf poet Donna Williams and paralysed poet Stephen Lightbown. I was the first poet to take the stage. I read six poems, some taken from my pamphlet, others from my first full collection (currently in preparation). Donna read next. She is a poet with a keen interest in translation and in how her poetry can be made accessible to hearing and deaf audiences alike. 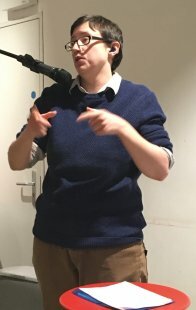 My name is Donna Williams and I am a Deaf British Sign Language poet, writer and consultant based near Bristol. DeafFirefly is a name partly inspired by a friend who answers to DeafTigerBee, and Firefly is one of my all-time favourite shows. All hail Joss Whedon. And hence, DeafFirefly was born. 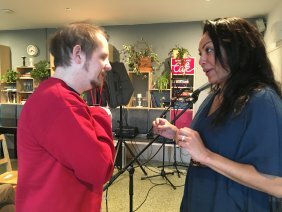 I grew up in the ‘hearing’ world, attending mainstream schools, and came to the Deaf world late, when I studied at the University of Central Lancashire. Joining the Deaf student community, I quickly started learning BSL, and I had some of the best years of my life. By the time I graduated in 2006, I could sign fluently and considered myself bi-cultural, moving in both hearing and Deaf worlds. This is an outlook I still have, as I spend time in both worlds, but sometimes this is not easy, I reflect on this in some of my poems. Headlining the evening and bringing the poetry sets to a close was Stephen Lightbown. Stephen was launching his first full collection, Only Air published by Burning Eye books. We ended with a Q&A session with Fiona hosting as well as asking questions before inviting questions from the floor. 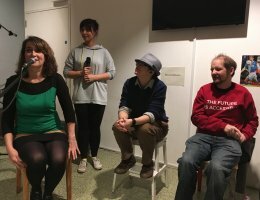 The photos below show the Q&A with me, Donna and Stephen first, followed by Fiona, Stephen’s wife, Carly, Donna and myself. Hello Giles! Carly here! 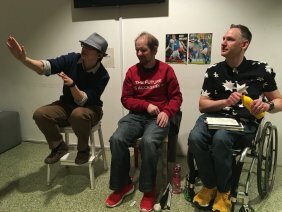 I just read your post and wanted to say I really enjoyed your write up of the other night! 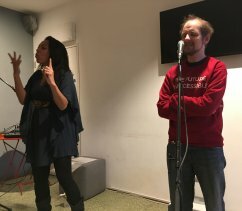 I felt really very privileged to have been involved in such an event and it was brill to meet you and hear your poetry. It was the first time Stephen’s ever put on an event like this and my first time helping him on the night – we were honestly over the moon that everyone was so engaged in the whole project. More to come I hope! Thanks so much again for travelling and speaking on the night. This sounds like a wonderful evening! You’ve described it so well, I wish I had been there to hear and see it all. Thank you for sharing your evening. This sounds fab. Even reading about it was fascinating. Well done, all!